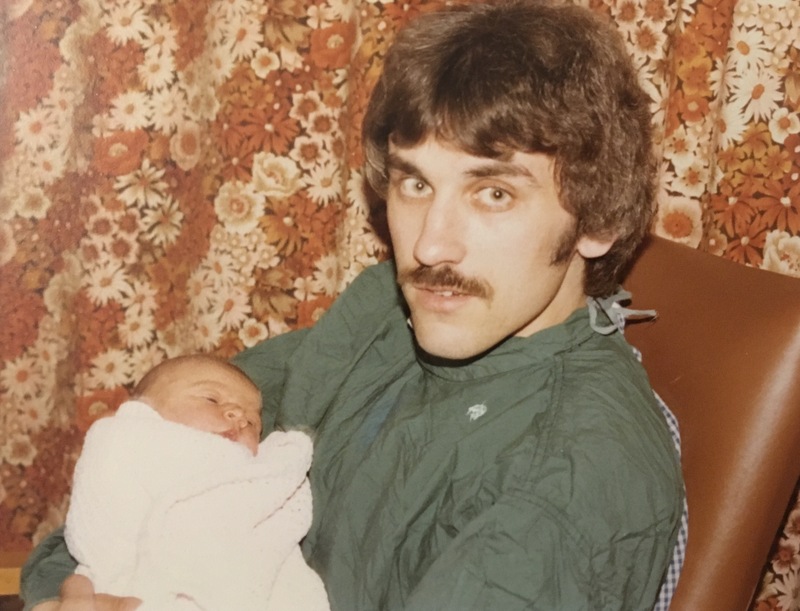 My Father’s Day blog comes with lots of pressure- ‘The Mother of all Days’ made my mum cry (in a good way!) and is one of my most visited posts so I feel like this one needs to be good! Luckily, as with Mums, I am very blessed with the ‘dads’ in my life in the various forms they take. 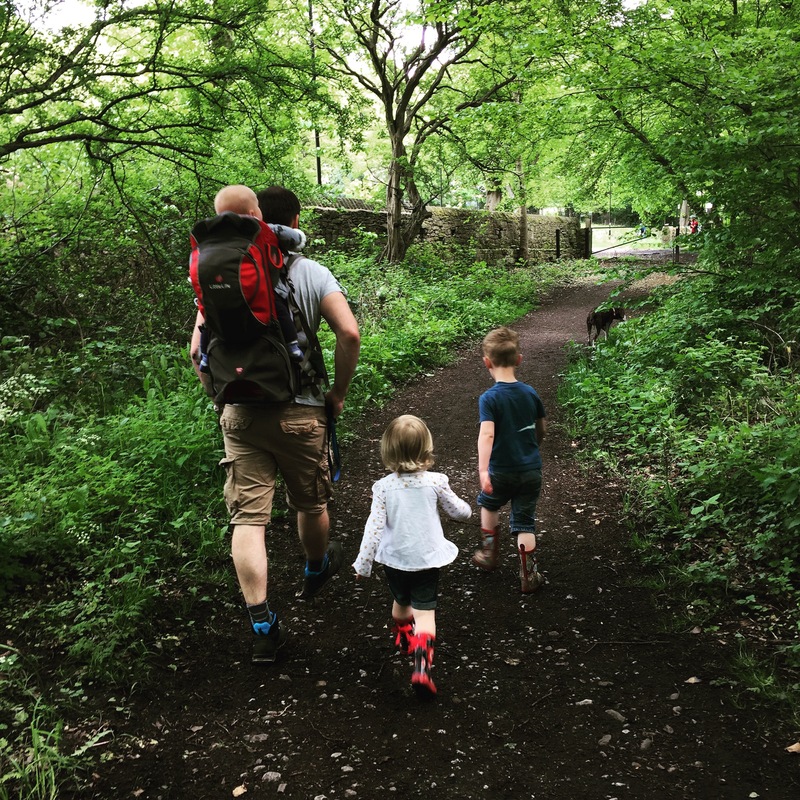 Being a dad and being a mum do seem to be very different jobs (in our house at any rate!) Whilst both come with an infinite amount of responsibility to care for and ultimately keep alive small humans, the roles within these and the way the kids see us seem to be divided! A perfect example of this would be the weekend morning lie in… On my morning with the kids, we come downstairs, have breakfast and then in no particular order, do jigsaws, paint, draw, build a train track, build KNEX, build lego, play board games, build duplo, bake, get the play dough out, play with the cars and dress up! All before 9am. In contrast, on Jons morning, he somehow persuades them to sit still on the sofa and watch Return of the Jedi! All three of them! For 2 solid hours! Ridiculous! I also seem to be the one they come to when they want or need something. I’ve known them leave the living room where they were sat next to daddy to ask me to get them a drink! George walked past Jon and came and opened the shower door where I was trying to get ready for a night out the other day to ask me if I’d help him find something! Jon is a really hands on dad and this isn’t a criticism of what he does and doesn’t do, but if there is a job that involves fetching stuff, getting stuff or wiping ‘stuff’ then the kids seem to see this a default mummy job! If I asked the kids what a ‘daddy job’ was I’m fairly sure they’d outline watching Star Wars films, chasing them around and having fun! Picking a partner who would be a good father was easy for me though… I’d had the best possible examples of what a dad should be Iike growing up, although admittedly you may be struggling to believe this if you’re basing your opinion on the photo below!! My poor dad had to spend 20 years living in a house with 3 women and all the hormones that come with that! He joked that even the bloody rabbit and dog were girls! And now he’s got even more to contend with as we’ve multiplied! I know everyone says this, but my sister and I have the best dad ever! Fact! 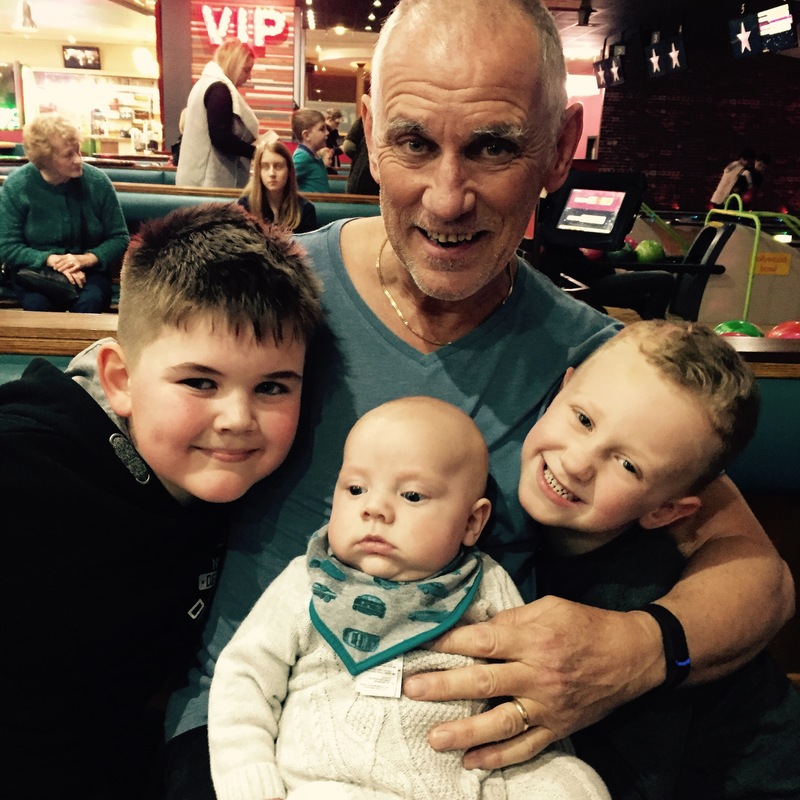 He is also a legendary grandad and our children are so very lucky to have him! Nothing is too much trouble for him, he will come and sort our garden or take the kids to school or come and help with bath time if Jons away! He decorates for us, takes the kids to the park, reads them a story and plays football with the bigger boys! My dad runs at everything at a million miles an hour and just gets things done (unless it involves using technology or the internet and then he will get the job done but only after claiming that ‘he didn’t even touch anything, he’s sick of the ‘bloody thing’ and muttering 5-10 moderate to severe swear words!) He has a head full of completely pointless trivia and can pretty much name any band and song from the first 2 chords or drum beats! I once pulled up at my parents house after work and saw my dad walking up the road with Esme in the pram, my nephew Jack walking along side, George on his shoulders and the faithful golden retriever Maisie plodding along next to him! He helps out on school trips at the school I work at and the kids love him; after accompanying our Y2s to The Deep, the recounts that they wrote were not about the fish or the aquarium but were about ‘Mr Emery’ and his adventures of the day! He is super grandad and the kids worship him! 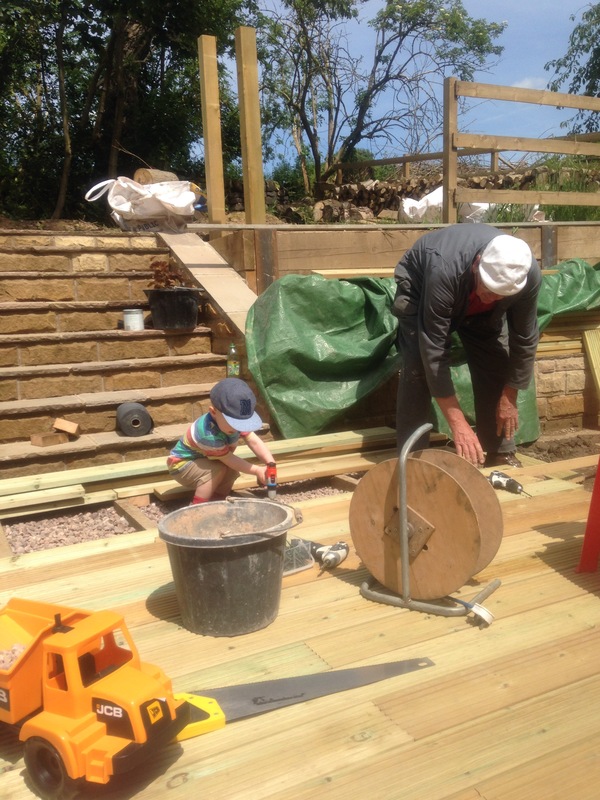 Our kids have two amazing grandads who nurture and care and help to raise them. 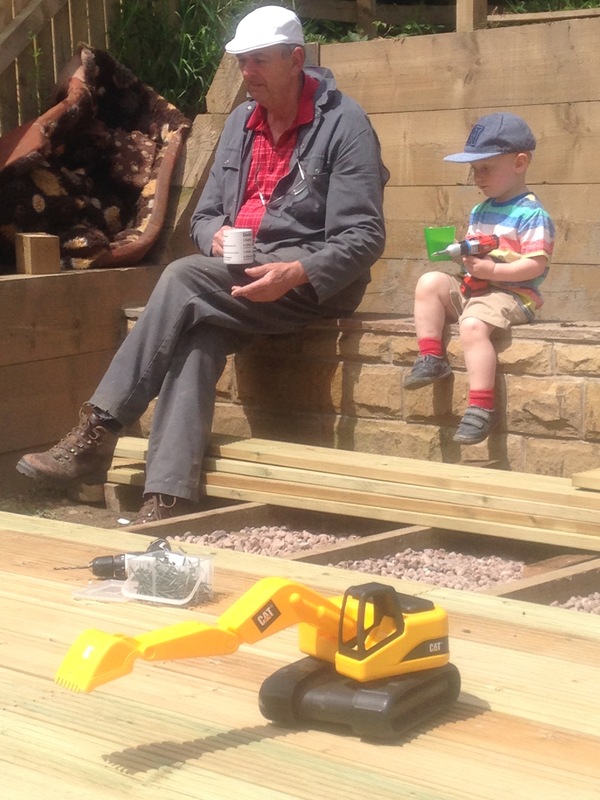 One of my favourite all time parenting moments was the photo below when my father in law came over one day to finish the decking in our back garden. A two year old George followed him round like a little shadow with his pretend tool box and copied everything he did. This also included the tea break! It was the perfect example of emulation and it created priceless memories that he still talks about today. It would also be remiss of me when mentioning fatherly role models to not mention my own Grandad. 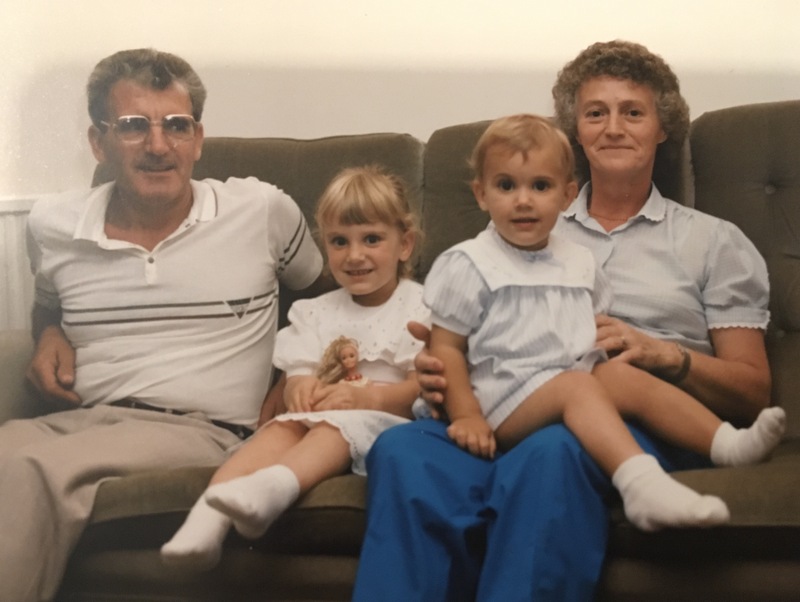 My grandad was a miner and took early retirement in the mid 80s when my sister and I were kids. It was still pretty unusual back then for mums to return to work but our mum worked as a nurse and my Grandad took over our childcare! This happens a lot now but back then this was fairly unique and I imagine quite a steep learning curve for a Barnsley coal miner! My Nan still worked and he took on looking after us and doing things in the house- my favourite story that summed up this time was that he used to do the ironing upstairs so that nobody would spot him doing it through the window! Oh the shame of being seen wielding an iron for a Yorkshire man in his mid 50s! My cousins were also part of this merry band of childcare and I remind this time of our life with such rosy nostalgia! We spent hours watching Mary Poppins and rearranging the furniture to make the car from Chitty Chitty Bang Bang and making my grandad be Burt while we pretended to jump through chalk pictures! When Jon and I got engaged and we told my grandparents we were getting married, my grandad jumped up, shook Jons hand and uttered the now immortal line ‘Well lad, you can’t be happy all your life!’ Ted’s middle name is Colin after my Grandad- we appreciate you may well get beaten up for it when people find out at school kidder, but please know that you are named after the most wonderful and noblest of gentlemen! My single biggest sadness in life is that we lost him before any of the great grandchildren arrived- he would have absolutely despaired at you all eating biscuits in the living room and nan giving you milk in your pretend tea pot and you running around like loons; but he’d have bloody loved it and you’d have all had him wrapped around your little fingers! I suspect Esme in particular would have played you like a harp! I know you are looking down on them and I hope you are proud. So in a parallel with Mothers Day, Father’s Day will be a time where we remember and celebrate all the wonderful dads in our lives and those we wish still were. We’ll give out the gifts and eat too much food, but more importantly, we’ll take time to remember how lucky we are to be surrounded by such hard working, kind hearted and generous men who are helping to raise our children and continue to raise the grown up children! And finally, well done to all of you for having eyes; It’s an important attribute for being a good dad as far as Esme is concerned!!! I did once get the song title wrong late at night in 1978 but I try to forget that nightmare! One further point worthy of making, both you and your sister owe it to me and only me, that you know all the words to Living on a prayer by Bon Jovi! Proper parenting! You’ve done again girl. Made me cry whilst remembering to be grateful for what we have had. ← Our favourite pastime! The wonderful world of Children’s Books!